Meet local judges and hear insights from the featured guest speaker, The Honorable Circuit Judge Jimmie V. Reyna, United States Court of Appeals for the Federal Circuit. Judge Reyna will discuss the current state of patent litigation and share his knowledge and experience as a judge having appellate jurisdiction over patent cases. 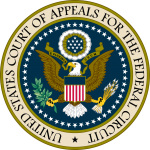 Judge Reyna was appointed to the United States Court of Appeals for the Federal Circuit by President Barack Obama in 2011. Prior to his appointment, Judge Reyna was an international trade attorney and shareholder at Williams Mullen, where, from 1998 to 2011, he directed the firm’s Trade and Customs Practice Group and its Latin America Task Force, and served on its board of directors (2006-08, 2009-11). The registration fee of $50 for members, law clerks, and academics and $75 for non-members includes a plated 3-course dinner and open bar with wine/beer/sodas. No CLE will be provided. Space is limited.